i go to the window and look down, and it shuffles along. blades bump into each other, correct their path, and go along some more—bumping again and again in total repetition. i get to the hose attached to the side of the house, and start to water the grass. in the morning, there’s no change. a whole yard of brown, bumping into itself, wanting to move just more. so slightly, freely. in the evening, the fireballs begin. tiny, quickly dissipating fireballs shoot in random sequence from the grass. the occasional sounds of scratching—tiny scratching. i go back to get the hose, careful not to get my feet set alight. i water the lawn again. the grass doesn’t change, only wettens. i paint a meatball red and blue, put googly eyes on it, and throw it into the yard. i try to give the imps a handshake through a familiar friend. it’s my cacodemon, again from doom. the imps ignore it for awhile, bumping into it every once in awhile. it becomes obvious that this is not a real cacodemon when the fireballs only dry out the meatball, and eventually blacken it. it never dies. 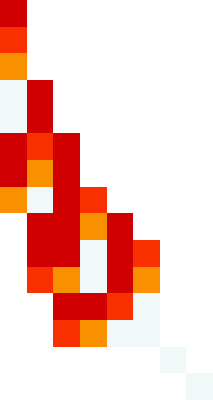 it gets burnt to a crisp, but its animation frames never really change anything other than their coloration. the next day, i take some of the imps inside, and put them in the bathtub. they have more room to move, don’t shoot fireballs, don’t scratch each other. slowly but surely, i move the imps who haven’t killed each other into my house. soon, my yard is a plane of corpses and a burnt meatball. imps are in every room inside the house, but comfortable. there is less scratching all around, and i suspect morale is high. i scrawl a few tiny pentagrams, write “666” in lipstick on the walls. one of the imps rodeos a cricket that has made its way into my house. several imps battle a spider they have randomly bumped into. they are very unsuccessful at first, but eventually overcome their obstacle. a few imps are cooked into a pizza i put in the oven for dinner. after a few days of having all of the imps living with me in the house, i put the lipstick on my lips, draw tiny pentagrams and write “666”s across my body. i lay down in the living room and open my mouth. some imps jump into my mouth right away. others try to enter through the ears, the eyes. one gets confused, trips into my navel. when all imps enter inside, i shut my hellmouth, and take a shower. the imps scratch and shoot fireballs at each other. there isn’t enough room for all of them in my gut. as the water heats my skin, the imps speed up inside. i belch smoke. i sit down to write a little note, and get carried away. the imps inside slow down. the scratches grow pensive, fireballs more rhythmic. it’s midnight before i know it. it’s time to put the imps to bed. the next morning, i’m covered in grass instead of hair. it has replaced everything. the imps inside scratch at the bodies of the dead in my gut. i go to shave my face free of the grass. the electric razor is almost dead, gets caught on tougher blades of grass, pulls at them more than cutting them. the batteries are new, but the razor is old. i, the imps inside want to cry out. when i bring the razor over my upper lip, there are no more fireballs. i belch a cloud of white phosphorus gas, and it ignites the skin on my head, face. the imps inside employ a scratch to the bottom of my stomach. the grass remains. the cloud of white phosphorus hangs across my face, refusing to fall. the imps employ more scratches to the bottom of my stomach; this is a game of unknown magnetism. i blink, scream once in agony, raise my arms into the cloud, razor buzzing. i plunge into the grass on my head. i plunge into the grass on my arms. i fall to the ground, charred. the cloud of phosphorus covers over my gut, the scratching matching its direction. the imps hold it there until the thinness of my skin, muscle gives out. a tiny hand juts from my gut, waves off the cloud. the grass becomes pink. the imps slip frantically out of the house, packing into the drain in the shower. these are barons of hell from doom. i write on my freshly trimmed legs “iddqd.” this is the cheat code for invulnerability, god mode. skin, muscle, calm fills in the patches of char across my body. hair reappears. the memory stays. i pluck the barons of hell from my yard one by one, and devour them whole. when they all cram inside of me, i write “iddqd” on my opposite leg. the cheat turns off. a mass of scratches and green fire pools in my gut. i go immediately to shave my legs. i feel a belch rising up in me. the barons work fast; i, faster. i feel theological as i lock my lips tight, close up my nostrils—no exit for gas. i get that feeling again, the feeling of putting googly eyes on everything pooling up inside. a cloud of white phosphorous chews my cheeks from the inside. my sinuses inflate in ignition. the barons climb out in a quick procession, hustling down the same pipes as the imps. the grass, dark tan with flecks of silver, red. cyberdemons—doom. i “iddqd” myself, god mode. another, again. i go out to wetten the yard, razor in hand. everyday things. Bryan Reid lives in Normal, Illinois, where they study creative writing at Illinois State University. Their work has appeared or is forthcoming in Festival Writer and DIAGRAM.